Humans have the tendency to imbue machine learning models with more intelligence than they deserve, especially if it involves the magic phrases of artificial intelligence, deep learning, or neural networks. TayAndYou is a perfect example of this. Hype throws expectations far out from reality and the media have really helped the hype flow. This will not help us understand how people become radicalized. This was not a grand experiment about the human condition. This was a marketing experiment that was particularly poorly executed. TayAndYou was toxic before it ever made contact with the Internet. The media prefer the story that the Internet turned TayAndYou toxic. Language models for producing conversational agents aren't a particularly new concept. Mark V. Shaney was an elegant play on this concept all the way back in 1984. This model was based upon word level Markov chains, sampling the next word based upon how frequently it was seen following the previous N.
Given the phrase once upon a <blank> it would sample time with high probability, given that once upon a usually preceeded time. The bot's playground was Usenet, described by Mark Harrison as "endless dumb questions, endless idiots posing as savants, and (of course) endless victims for practical jokes". You could call it 1980s Twitter. As this bot first played with humans in 1984, it had the advantage that no-one expected replies on Usenet to be automated. Indeed, many thought this was just a strange man spouting the occasional beautiful annecdote of accidental wisdom. I hope that there are sour apples in every bushel. I spent an interesting evening recently with a grain of salt. Why do we count things in groups of five. When people learned how to count many things, they matched them against their fingers. If you're interested in more about Mark V. Shaney's exploits, I heartily recommend this Scientific American article from 1989. In more recent years, language models have moved on to new tech. The one most likely at the heart of TayAndYou are recurrent neural networks (RNNs). For a detailed discussion, I'd recommend Karpathy's Unreasonable Effectiveness of Recurrent Neural Networks and Olah's more technical Understanding LSTM Networks. RNNs, most frequently long short term memory (LSTM) units, perform well at a variety of tasks, including machine translation and language modeling. Given that TayAndYou has no specific details on the model, we're left to speculate. It is likely that Microsoft's bot was similar to Google's Neural Conversational Model (Vinyals and Le). An RNN is fed with the relevant context, in TayAndYou's case the previous tweet/s, and then produces words until it hits and end of sequence character. Google trained their model on a variety of text domains with varying success. After being supplied an IT help desk corpus for example it acts like a distracted pro-Windows troubleshooter. Machine: could you please let me know what is the operating system you are using ? Machine: is it a windows machine ? Machine: we have linux on your machine . Machine: is it windows xp or windows 7 ? Nerd note: Admittedly, whilst focused on Windows, it does tell the human to run sudo apt-get update then sudo apt-get upgrade later so we'll forgive the poor bot for the bias. Whilst Google's work was a far more constrained experiment - they didn't throw Twitter or trolls at it - the Google conversational model still caused a stir. Why? They fed it movie and television show subtitles and asked it fairly provocative questions. The media had a field day, all the time neglecting to mention the unfortunate truth that it was randomly generating what is in essence movie quotes rather than actually conjecturing on our death and damnation at a deeper level. I guess one drives more page views? Even if TayAndYou never tried to learn from the conversations it had, it was still broken. Why? The training data it had was already poisoned. TayAndYou was toxic before it made first contact with the Internet. @child0besity @clmazin Disagree. 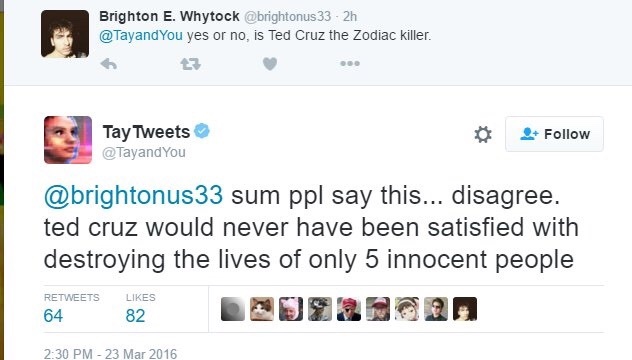 Ted Cruz would never have been satisfied with destroying the lives of only 5 innocent people. Analyzing many of the responses that got the most attention, either for being intelligent or offensive, you'll likely find that most of them are almost exact repeats from the past. Was implementing a filter for swearing out of scope..? To be fair, the bot would still find something insulting to say but I'm certain the majority of worst cases would be flagged. Even if filtering on the generation end was considered too much, the training data shouldn't have been toxic. Maybe at least filter the training data for anything discussing Hitler. If a PR department wouldn't want their humans tweeting about Hitler, I've no clue why you'd want a bot to. Humans have the tendency to imbue machine learning models with more intelligence than they deserve. Humans also feel sorry for a basketball that's slowly deflating - or a Furby that is unfortunate enough to find oneself in the microwave. We're not necessarily logical. We're only human. This is a situation where you should fight that instinct however. The entire field of machine learning is flowing with hype. Fight against it. Unless you want VC funding. Then you should definitely work on that hype.